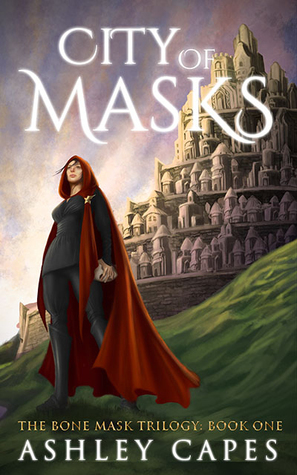 Welcome to the book blitz for CITY OF MASKS, the first book in the adult fantasy series, Bone Mask Trilogy, by Ashley Capes. See below for information on the book, buy links, a exclusive excerpt, and details on his giveaway. The chill of prison bars against his temple did little to ease Notch’s headache. Decades of dank didn’t help either, nor snoring from another cell, where someone was impersonating a bear. Or dying. In the poor light it was hard to tell. Notch squinted. Noon sun barely crept through the small, grated windows on his side of the building. Even cells across the way were shadowed. Sunlight, in addition to a piece of bread and some water, were high points, while the straw ‘bed’ and stale body odour of criminals were typically unpleasant. Worse places than Anaskar City prison existed. At least he hadn’t been beaten yet – a twinge in his shoulder reminded him how much some guards enjoyed their work. His cellmate raised his voice and Notch turned. The man had probably been speaking for some time; his drawn face was expectant. Years of imprisonment had washed out his Anaskari tan. Notch grunted. Nothing special for a convicted man to write; since waking on a pile of old blankets that morning and meeting his cellmate, he’d heard a dozen similar sentiments. Through Bren’s meandering introduction, Notch had winced, probing his body. Both arms and chest were heavily bruised and his head so fragile he wouldn’t be surprised to learn a wagon rolled over it last night. Possibly twice. He wasn’t drunk, though the smell of ale was on his breath. One damn drink, that was all. His leathers and tunic were splattered a dark red. Not his own blood, the City Vigil told him as much when they hauled him off the street, as if he couldn’t figure that much out. But whose? His own memory was unreliable, which made no sense. He hadn’t been drunk, truly drunk, since right after the war. When he bore another name. A name he left on some tavern floor, after making a convincing go of drinking the memories away. A good bath did for the sand on his body, but the blood-soaked sand in his mind? No amount of ale had washed that away. And now the Vigil were telling him he’d been so intoxicated he had to be dragged to the prison? “The Shields probably caught him doing something bad, that’s why he wrote this,” Bren continued, tapping on the wall. His too-bright eyes looked up at Notch. Bren laughed, its shrillness cutting through Notch’s skull. If it hadn’t been unsettling, Notch would have thumped him, but there was something wrong with Bren. Any fool could see that. A moment of quiet fell between them. Distant voices drifted from beyond the prison walls. Notch clenched his jaw. He should have been out there. On his way to another job. The Blue Lady, a fat merchant ship, would have sailed with most of his possessions on board. No chance of seeing it again. He wrapped his hands around cold bars and squeezed. “The guards say it too, the guards say you killed her,” Bren said, unperturbed. Ashley occasionally dabbles in film, is addicted to 80s cartoon shows and Studio Ghibli films, and finds himself constantly awed by the simple beauty of haiku. He is also convinced that ‘Magnum PI’ is one of the greatest TV shows ever.